Indian Railways is all set to take a giant leap in technology with the upcoming Train-18. The new train has been manufactured under the Make in India project and is going to replace the very popular Shatabdi Express trains. In June 2018, India’s first self-propelled, semi-high speed train (160 km/h) will start operating for inter-city travel. The train is loaded with state-of-the-art features and world-class amenities. It’s being manufactured at ICF (Integral Coach Factory) in Chennai at half the cost of a similar set if it were to be imported. As per reports, the first train set will have 2 executive chair car coaches with a seating capacity of 56 while it will have 14 non-executive chair car coaches that would occupy 78 passengers. Codenamed as Train-18, it will have a stainless steel car body with LHB as the base design and continuous windows, much like any other car chair type train. Moving on, it will be fully air-conditioned with comfortable seats and diffused lighting for the interiors. There will be onboard wifi, infotainment, and GPS-based passenger infotainment system. Coming to the aesthetic features, it will have halogen-free rubber-on-rubber flooring, energy efficient LED lighting, and roller blinds. There will be bio-vacuum toilets and touch-free bathroom fittings. The seat space will be enough for passengers to park their luggage and the coaches will be connected to each other with completely sealed gangways. Also, there will be space for parking wheelchairs for accommodating differently-abled persons and the door will be opened and closed automatically at every station, much like that of a metro train. 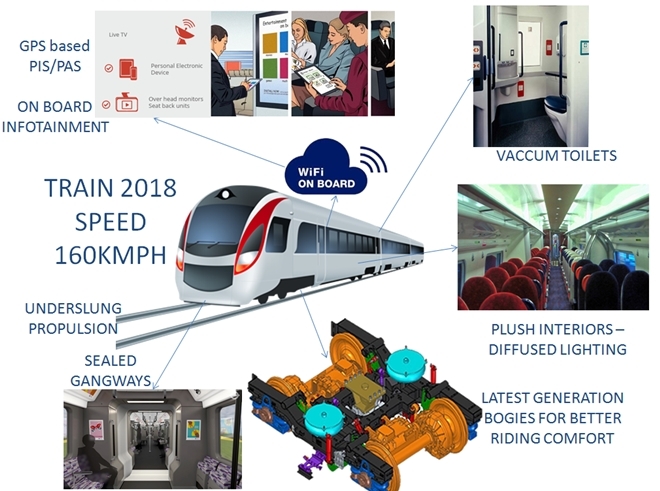 Talking about the technicality, these trains will have no engine reversal needs implying quick acceleration and deceleration thereby reducing the duration of travel. Other features include reduced aerodynamic drag for improved energy efficiency, improved air ducting, etc. Next articleCognizant’s bank accounts frozen by the government. Why?